True Blue is a tactical media experiment involving how images are searched and sorted on the internet. 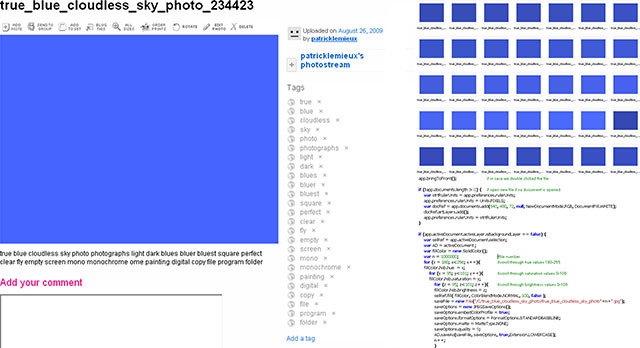 In 2009, every shade of blue was generated in the form of monochromatic digital images. These 900,000 images are currently being uploaded to Flickr, Picassa, and Patrick-LeMieux.com in an effort to influence Google Image Search and Yahoo Image Search. If successful, some of these 900,000 computer generated images would be returned upon querying any variation of the terms "blue" and "sky."